Perfect for either a dinner party dessert or your next coffee morning, this sweet tart is easier to make than it might seem at first glance. Short crust pastry is a doddle and once you've nailed that, everything else will fall into place. Break open the cardamom pods, shake the black seeds into a pestle and mortar, and crush to a fine powder. Sift the flour into a bowl, stir in the cardamom and rub in the butter until it resembles fine breadcrumbs. Stir in the sugar. Add the egg yolk and mix to a smooth dough, with a little cold water if necessary. Roll out the pastry and use to line a 20cm loose-based flan tin. Prick the base with a fork. Line with baking parchment and fill with baking beans. Bake for 15 minutes, then remove the paper and beans. Brush the pastry with the egg white. Return to the oven for 5 minutes. Put the cream and chilli flakes in a heavy-based pan. Heat until almost boiling, then remove from the heat and set aside to infuse for 5 minutes. Put the butter and chocolate in a heatproof bowl. Reheat the cream and pour through a sieve onto the butter and chocolate. Stir until the chocolate has melted and the mixture is smooth. Pour the mixture into the pastry case and leave to set at room temperature (about 3-4 hours). To make the praline, heat the sugar in a heavy-based pan over a low heat, swirling it around occasionally until it's all melted. Increase the heat and boil until it's a golden caramel colour. Remove from the heat and tip in the peanuts, swirling them around to coat them in the caramel. Immediately pour the mixture onto an oiled baking sheet and set aside to harden. 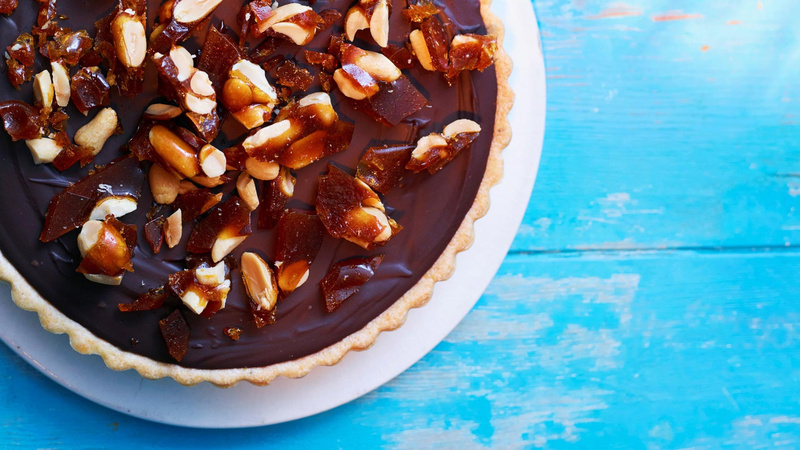 Using a rolling pin, smash the cooled peanut caramel into small pieces and scatter over the tart once it has set.